For Vivek, art has always been a way to explore her identity, learn where her heart is, and own her experiences. Her multidimensional and genre-bending art, which includes everything from photography to poetry, delves deep into the intersections of race, religion, gender, and sexuality with heart and raw honesty. As a musician, a writer, and a filmmaker, her work is striking a chord with new audiences everyday: she’s a four-time Lambda Literary Award finalist, a former Toronto Pride Grand Marshall, and was named one of Out Magazine’s “9 Trans Influencers You Should Follow”. She performs internationally at shows and festivals, and has even shared a stage with Tegan and Sara. 2017 has been a big year for Vivek. Her first book of poetry, even this page is white, won a Publisher Triangle Award and she released a new album, Part Time Woman, a collaboration with 12-piece chamber pop collective Queer Songbook Orchestra that explores her experience as a trans woman of color. For this week’s Feministing Five, I had the pleasure of catching up with Vivek about the relationships between her many artistic projects, why Hinduism was so critical to her understanding of gender, how she’s working to support young artists of color, and more! Catch Vivek on Twitter and Instagram at @vivekshraya — there’s clearly no slowing down for this badass femme on the move. Senti Sojwal: Congratulations on your new album, Part Time Woman, which came out last month. You’ve described this album as “for trans people by trans people” and called it “a love song to other trans girls”. Sonically, this album is a departure from much of your previous musical work. What was the process like for you of creating this album? Vivek Shraya: Music is my first love, it’s how my artistic life really started. That’s why I moved to Toronto back in 2003. I really struggled with my music career in this industry and needed to take a break. Six years ago I put out my last solo album and started exploring other kinds of art more. It was exciting because I felt like for the first time, my art was connecting with other people in a more significant way. Throughout that process, I still felt a longing for music. It sounds corny, but it feels like a relationship I had. Turning art into a career can be painful. A couple of years ago, I felt like I was ready to open my heart to music again. Around that time I met a local producer and we started to talk about my music and what it could look like, collaborating on a few singles. In 2016 I came out as trans and wrote a song called “Girl It’s Your Time” announcing my use of she/her pronouns. I started working with the Queer Songbook Orchestra, and they take songs that have queer themes and reimagine them in an orchestral setting. It was so incredible. I started really wanting to make an album, something totally different than anything I’d ever done. Senti Sojwal: You’re an incredibly multifaceted artist — you are a poet, a writer, a filmmaker, a photographer, and a musician. What’s the relationship between your different forms of self expression and artistry? Do you see your various artistic explorations as extensions of one another? Vivek Shraya: I do think they’re connected and try to connect them as well. In thinking about the album, I really saw it as a story from beginning to end. I think that was really informed by storytelling through writing. I think so much art I’ve made in the past ended up being inspiration for this album. Taking a break from one medium allows you to strengthen a particular muscle, and then coming back to it with a new perspective or skill really helps all these artistic processes. The fact that my music career didn’t initially take off made me more multi-disciplinary. Even when I do book readings, I tend to sing. My films have involved music I’ve scored. I’m a lot more excited about the possibilities of blending and extending the lines between art mediums rather than identifying with one strict form of art. Senti Sojwal: Can you talk about navigating the intersections between your trans and South Asian identities? What has it been like to navigate your transition as a South Asian? Our culture actually has a long and beautiful queer and transgender history that was erased and maligned through colonialism, but it feels like today, our culture is always depicted as incredibly conservative and stifling. Vivek Shraya: I often cite Hinduism and my Hindu upbringing as one of the only sites of nurturance for my gender creativity. Even though I wasn’t identifying as trans as a teenager, there was something gender nonconforming about my identity. I was on the receiving end of lots of homophobia and experienced a lot of resistance to my expression. But in South Asian spaces, specifically the Hindu community that I participated in, I was seen as special. It was so strange to some days be treated as a version of Krishna because I liked to dance and sing and loved and respected women so much, where my gender was seen as something to nurture and celebrate, and the rest of the time, back at school, being called “fag” everyday. I didn’t have queer or trans role models in 1980s Edmonton, but I had Hindu gods, whose gender was so fluid. South Asian culture and Hindu culture really allowed me to express my gender and I don’t know that I would have come to transness without those aspects of my upbringing. Sometimes your art is ahead of you, and you’re comfortable expressing things artistically before you’re ready to express them elsewhere. Ardhanarishvara is a Hindu god that is half Shiva, half Parvati — half male, half female. Being part of a culture where I could see that was so important to my gender nonconformity. 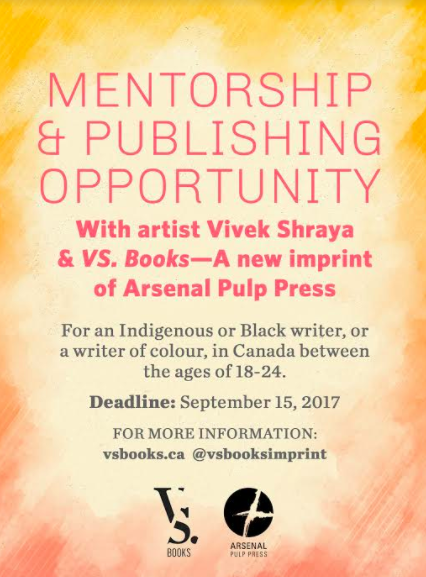 Senti Sojwal: You recently launched VS Books, a mentorship and publishing opportunity for a young writer of color living in Canada. Can you tell us about what spurred the desire to create this program for you, and also what kind of mentorship propelled you in your early days as an artist? Vivek Shraya: In marginalized communities, I think we have a tendency to not always be supportive of one another because of scarcity models. It’s so competitive. People can lash out at each other — I feel like I’ve seen this in Toronto and I’m sure it happens in every major city. I felt very disheartened by witnessing and experiencing this. I was trying to figure out what I could do to change this somehow. I decided that while I couldn’t change it, I could create some kind of gesture in response. I created a mentorship program in 2016 for one young artist, and ended up getting so many applications. I decided I would reframe the program so I could work with all of them. I worked with one per month. They were all over — Malaysia, New York — we’d Skype for an hour or two and connect on email and I’d give feedback. It was exciting to think about mentorship in a more condensed way. At the end of last year, I was starting to reevaluate the program. I started to think about what young artists really wanted. Mentorship is a value, but I don’t want to do that thing that grown ups do where they say, “this is what the kids of today need”. I think it’s so much more important to let young people tell us what they need. I think that’s so critical, over being imposing. Consistently, the feedback was that people needed support getting published. I started imagining a mentorship and publishing opportunity — where I would offer support in feedback and editing, and I would fund the project for publication. Funding my own work as a writer was huge in terms of getting my foot in the door of the publishing industry. I wanted to find a way to bring institutions on board, and reached out to my own publisher, who has a number of times taken risks with me. Last year they did both a book of poetry and a children’s book with me, even though their submission policy on their site states they won’t accept either of those! They’ve broken their own rules to support me, so why not just ask? I pitched the idea in October, and in April it became official. 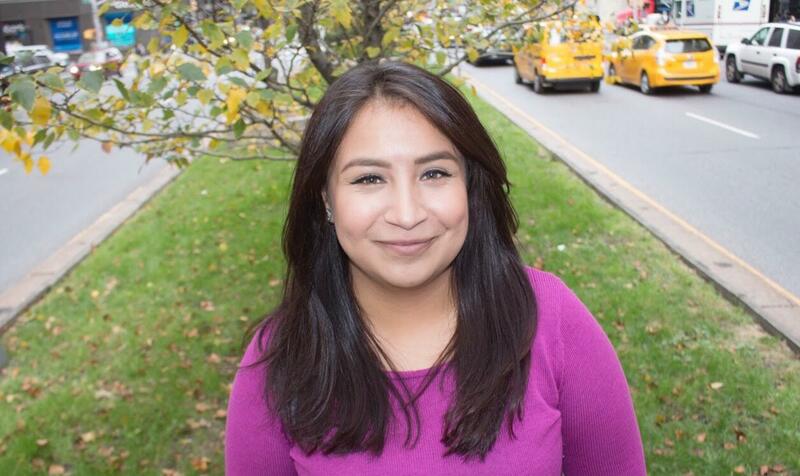 For me, it feels like an exciting opportunity to create more space for a young writer of color in terms of not just a book deal, but to offer support in terms of things I wish I had known as a younger person. Senti Sojwal: In an interview with Autostraddle, you talked about the difficulty of having to be certain about all aspects of your gender identity at all times because trans people are rarely allowed to express gender ambiguity or evolve in their identities lest they be seen as “deceitful”. 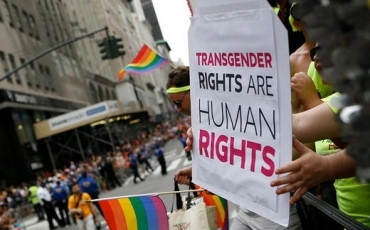 What are some of the most critical ways you think our understandings of gender and gender identification need to be challenged and reshaped, especially when it comes to allowing trans experiences to be nuanced? 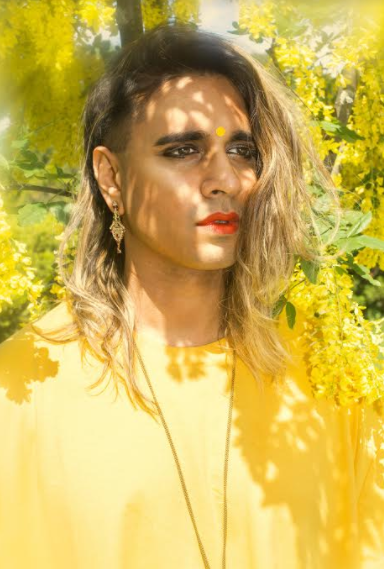 Vivek Shraya: When I was trying to figure out pronouns, and reading about people’s processes of choosing “the right” pronoun, everything I found online and everything I heard when I spoke to people was this narrative of “I always knew”. There’s almost this Goldilocks narrative, except instead of trying out three different things and getting it right in the end, she just knows immediately what’s right for her. While I fully respect people who have had that experience, I personally never did. I’ve been called “he” and “him” for thirty-five years, and though increasingly there are moments where “her” and “she” feel lovely and right for me, it’s been an adjustment for me as much as the people around me. People will say “she said….” in reference to me and I’ll feel like, who are they talking about? I wish we were allowed the space to ask questions, to evolve, and to not be so tied to a particular destination or designation. I do anti-homophobia and anti-transphobia trainings and workshops in my job at a college. One of the things I would hear from participants when I was beginning my transition was “I knew this one trans person and they just kept changing their mind”. This is always brought up as a way to undermine the validity of someone’s gender expression, which felt so wrong. For me, it was terrifying. I felt like I always had to be sure, otherwise I would be “discredited”, too, even though in reality, I knew that I deserved that space to figure things out. It’s interesting because I’ve been faced with this song and dance before with my bisexuality. Essentially, our culture is terrified of any gray area. Any ambiguity is threatening and uncomfortable, and consequently, many of us are not allowed to live the way we should be allowed to. This includes people within queer and trans communities that have these very defined ideas of what “gay” looks like and what “queer” looks like and what even “trans” looks like. I feel a responsibility to complicate those narratives. Circling back to the album, calling it Part Time Woman felt like a gesture in complicating this idea of womanhood. A complete womanhood. Who or what gets to decide what makes a full time woman?